Ridgway, CO (DATE) – Twenty-six of the nation’s most influential food and nutrition professionals visited the Fargo area this week as part of the second Wheat Safari, hosted by the Wheat Foods Council (WFC). Safari tour guests included prominent food and nutrition bloggers, academics from major universities across the country, newspaper editors and broadcast journalists. Program speakers included noted carbohydrate expert and nutrition educator Julie Miller Jones, Distinguished Scholar and Professor Emerita of nutrition in the Department of Family, Consumer and Nutritional Sciences at the St. Catherine University in St. Paul, MN. Dr. Jones addressed the group on nutrition issues, including how to help consumers identify whole grains in their grocery stores, and why gluten-free diets only make sense for those diagnosed with celiac disease, wheat allergy or non-celiac gluten sensitivity. During their time in North Dakota, the group toured a farm in Portland, ND, to learn first-hand about the harvesting of the wheat crop. They also visited the North Dakota Mill in Grand Forks, the Conte Luna Foods pasta plant in Grand Forks, and the Northern Crops Institute and Wheat Quality Labs at North Dakota State University. The Wheat Foods Council is a nonprofit organization formed in 1972 to help increase public awareness of grains, complex carbohydrates, and fiber as essential components of a healthful diet. The Council is supported voluntarily by wheat producers, millers, bakers, and related industries. 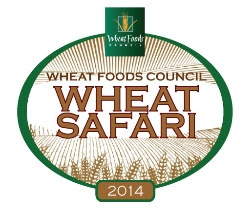 For more information, visit www.wheatfoods.org.